← How to convert XML to PDF by Office to Any Converter? and Document Converter. In this article, I will show you to make flipbook by Flipbook Maker Pro and Advanced PDF Page Cut. Step 1. Download those two software. Both of those two software are GUI version, if you mater one way to install it, then you can install both. Once downloading finish, there will be exe file in the downloaded package. Please install it by double clicking the exe file and follow the installation message. Once installation finishes, there will be icons on the desktop. Simply click icon then you can launch those software. Step 2. Trim PDF by Advanced PDF Page Cut. 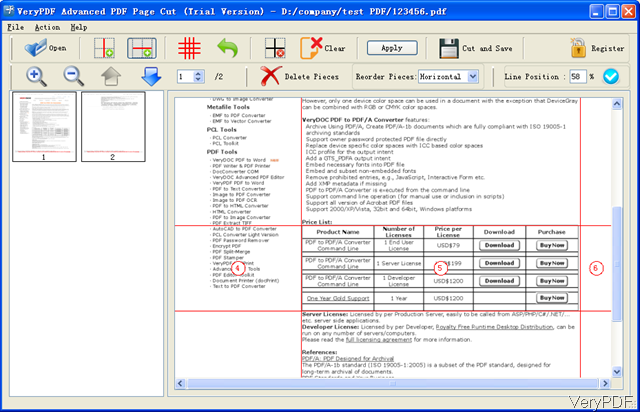 This software can be used to break PDF pages into small pages. The following snapshot is from the software interface. By this software, you can extract any part of PDF file and then save it as a new PDF file. As when you make flipbook from PDF file, there is also some some parts which are redundant. If you make flipbook with those redundant parts, it will be a kind of waste times and energy. This software is really helpful when you need to make flipbook from paper books. When scan paper book to electronic version, some times there will two pages in one sheet. But when we make flipbook, we need to make single page in one page. Then this software will play a great role, as it can cut those sheets with two pages into single page in batch. Step 3. Make Flipbook from chosen PDF file. Flipbook Maker Pro supports PDF as input. By this software, you can convert PDF to flash flipbook with stunning effect. The following snapshot is from the software interface. Please click button Input then you will see the dialogue box like I showed in the interface. As we need to input PDF file to make flipbook, please choose Input document and click icon of folder then you can browse the folders which contains the PDF file. Here you can choose to make flipbook by bitmaps or flash. Once finish setting part, please click button Import to back to the main interface. This step may take a few seconds if the input file is big. In the main interface, you can do the setting part, like background music, image and style. Once finish setting part, click button Save to choose the output file format flash, exe or zip. Up to there the customized flipbook made from cut PDF can be done perfectly. With those tools, you will find it is easy to make flipbook for perfect presentation. During the using, if you have any question, please contact us as soon as possible. This entry was posted in Flipbook Maker and tagged make flipbook. Bookmark the permalink.